when it is the only one we have." Classic Activism revolves around getting the proper practices needed to live sustainably adopted. In the popular jargon of activism, Classic Activism is "solutions oriented." Let's examine how Classic Activism works by seeing how proper practices flow through the process. A proper practice is a behavior that if followed, would directly help to solve the problem. Examples of the proper practices needed to solve the sustainability problem are use of renewable energy, the three R's of reduce, reuse, and recycle, closed loop manufacturing, and the Kyoto Protocol treaty on climate change. Let's walk the diagram. The problem symptoms are always caused by proper practices not being followed. If the proper practices are not yet known, then step 2 is needed to find the proper practices. Then if people don't know about the proper practices or why they should practice them, the step 3 is needed. This attempts to tell people the truth about the problem and the proper practices. If that's not enough to solve the problem, and it usually isn't, step 4 is needed. This tries to exhort, inspire, and bargain with people to get them to support the proper practices. If step 4 doesn't work, what does a classic activist do? The only thing they can do: repeat the steps and somehow do them better. Since that doesn't involve any sort of root cause analysis or treatment of change resistance as a separate problem to solve, it can't work. But try to tell that to a veteran activist and your message will bounce right off. A true classic activist is immune to all attempts to persuade them that their problem solving approach is not going to work or could be improved. I know. I've tried it over and over. I've tried a positive approach. I've tried a peer reviewed paper. 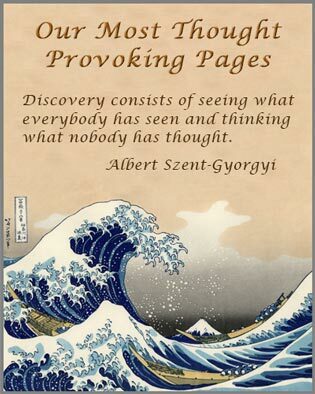 I've tried several books. I've tried chatting with environmentalists and calmly explaining the limitations of Classic Activism just as this website tries to do. I've tried joining organizations, getting to know how they work, and then proposing reform with a detailed article or document that examines the organization at length. It has never worked. Apparently the hold of Classic Activism on the activist mind is so strong that paradigm change resistance prevents classic activists from seeing there could be any other way that could work. Classic Activism is the method used by all environmentalists and environmental organizations today, including those in grassroots organizations, academia, business, and government. We say "all" because of the hundreds we've examined in the last ten years, none deviate from reliance on these four steps as their main problem solving process. Additional steps are employed by some organizations, as shown in An Assessment of the Process Maturity of the Environmental Movement. But the additional steps are done in a low process maturity manner, so they don't help much. 1. Classic Activism doesn't resolve root causes. 2. Classic Activism doesn't treat change resistance as a separate problem to solve. This is the strategic reason why the environmental movement has failed to make any significant progress in solving the global environmental sustainability problem in the last 30 years. 1. Identify the problem to be solved. 2. Find the proper practices that, if adopted, would solve the problem. 3. Tell people the truth about the problem and the proper practices. to support the proper practices. The paper on Change Resistance as the Crux of the Environmental Sustainability Problem modeled the process of Classic Activism. 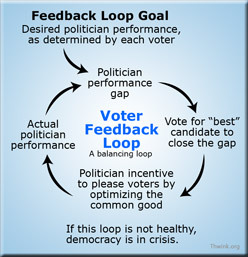 The paper showed how classic activists suffer from a gigantic blind spot, as thoughtfully explained in the diagram below. Classic activists can't see anything above the dotted line because they are so certain that what's below the line will work. For much more on how Classic Activism works and why it fails on difficult problems, see the paper. 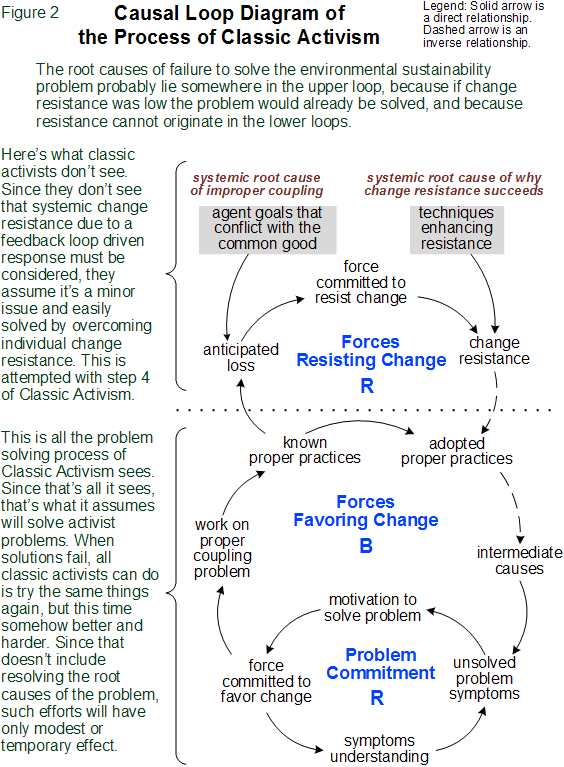 Classic Activism is a classic example of the intuitive process trap. It's intuitive because its not grounded on analysis of the problem as a whole. It's a trap because it works on easy problems. Therefore it should work on all problems, the logic goes. But it doesn't as the history of environmentalism has shown. The alternative to Classic Activism is Analytical Activism. 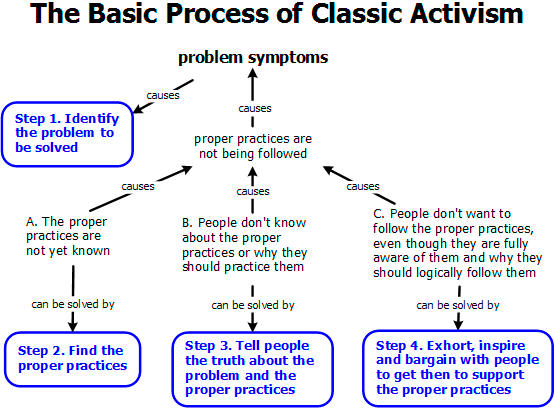 The classic approach uses an informal intuitive approach to solving problems, which works fine on easy problems. The analytical approach uses a formal analytical approach, which is what's required for difficult problems. The difference between the classic and analytical approaches is huge. But that doesn't mean the analytical approach is hard to learn. It's no harder than tricky concepts you are already familiar with, like evolution, the principles of democracy, and the critical importance of the invention of agriculture.